Vote By Mail Options have changed! On August 10, 2018, new legislation went into effect that changes the options voters have when voting by mail, AND, IMPORTANTLY, changes the way SOME voters have been assigned to vote in future elections. If you voted by mail in the 2016 General Election, the new law has assigned you to be a “Vote-By-Mail Voter” — unless you notify your county clerk in writing that you want to be removed from the permanent vote-by-mail list. A law signed by Governor Murphy on August 10, 2018 mandates that any voter who requested and received a Vote By Mail Ballot for the 2016 General Election be put on a list to automatically receive Vote By Mail ballots for all future elections, beginning with the upcoming November 6 General Election. 2016 Voters who fall into this category but do not wish to receive mail-in ballots for every election in the future will be able to “opt out” by notifying the County Clerk in writing that they no longer wish to receive Vote By Mail ballots for all future elections. These voters still have the option of Voting By Mail in any election of their choosing, but will have to submit an application for a Vote By Mail Ballot whenever they choose to do so. Request a mail-in ballot for a SINGLE election whenever you wish to vote by mail. Click here to download the updated Application For Vote By Mail Ballot. Click here for answers to popular questions about how the new law affects voters. Are you planning to vote this November 6th? If not, ask yourself why not? If it’s because you’re not registered, or you aren’t familiar with our voting machines, or maybe you think your vote doesn’t matter – please give the County Clerk’s Office a call and we’ll do our best to hook you up with the information you need to ensure you make it to the polls – with confidence – on Election Day. If you’re planning on not participating because you don’t know enough about the candidates on the ballot – you still have time to do some research. Talk to friends and family – engage in conversation. Find out how candidates’ views differ on the issues that matter most to you. Education? Jobs? Environment? Public Safety? Transportation? Check out candidates’ social media pages. Look up newspaper articles. Contact the campaign headquarters of local candidates. Get answers. When it comes to selecting the next Governor of New Jersey, you may find it insightful to read the gubernatorial candidate statements we’ve posted to our website (https://sussexcountyclerk.org/elections/ ). Remember that November’s winners will affect public policy moving forward. Whose public policies do you want to see implemented? If you do plan to vote this November but aren’t sure you’ll be able to make it to the polls on Election Day – because of travel, illness, or any reason whatsoever – YOU HAVE OPTIONS! You can vote early by mail, or you can vote in person at your County Clerk’s Office. Mail-In Ballots are available about 45 days prior to Election Day. That gives you plenty of time to plan ahead. You can download a Vote By Mail Ballot Application, or call our office and request an application be mailed to you. Mailed applications must arrive to our office on or before October 30th – this is so that we have time to mail you your ballot, and you have ample time to mail it back to the Board of Elections. The Board must receive your ballot before the close of polls (8 p.m.) on Election Day. After the mailing deadline has passed, voters still can apply and vote in person at the County Clerk’s Office up until 3 p.m. the Monday before Election Day (Nov 5th). Visit https://sussexcountyclerk.org/elections to learn more about early voting. Be engaged. Be a voter. Follow link to view results from today’s 3 p.m. drawing for Federal, County & Municipal candidate positions. 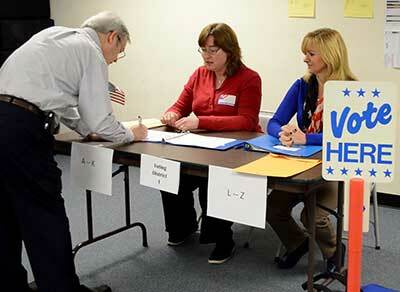 Click to view the results from today’s 3 p.m. ballot draw for school board candidate positions. New Jersey residents who plan to travel by air on domestic flights on or after October 10th should make sure they have adequate I.D. before heading to the airport. According to the Department of Homeland Security (DHS), New Jersey has had an extension for REAL ID enforcement, allowing Federal agencies to accept driver licenses and identification cards from New Jersey at Federal facilities, nuclear power plants and federally regulated commercial aircraft until October 10, 2018. Unless the federal government affords New Jersey another extension, beginning October 10 NJ citizens will need more than their state-issued driver license to board domestic flights. Other federally accepted forms of I.D. for domestic air travel include the U.S. Passport Book or Passport Card. Travelers who do not already possess a U.S. Passport may want to consider applying for one or both. The Passport Book also allows you to fly internationally, while the Passport Card limits you to domestic air travel and/or international travel by land or sea ports of entry. Your County Clerk’s Office is a certified U.S. Passport Acceptance Facility and can assist you with the application process. Visit our Passport Page for more information on what’s needed to apply for a U.S. Passport Book or Card. Visit DHS for possible NJ extension updates and to learn more about REAL ID. The ballot draw for candidate position on Sussex County’s 2018 General Election ballot (including school board) will be held on Mon., August 13 in the County Clerk’s conference room. Candidates and members of the public are welcome to attend the draw, which begins promptly at 3 p.m.
FYI — The NJCCIC continues to receive reports from members involved in real estate transactions – including agents, lawyers, title agencies, and buyers – detailing incidents in which they were targets of profit-motivated hackers who attempted to defraud them out of thousands of dollars. In a recent incident, hackers impersonated a title agency by spoofing their email address and sent wire transfer instructions to homebuyers requesting their closing costs. In similar schemes, hackers have targeted and gained access to the legitimate email accounts of real estate agents, title agency representatives, paralegals, or homebuyers via compromised account credentials and then used their accounts to send convincing emails to targeted victims. The subject and body of these emails often portray a sense of urgency in an attempt to have targets immediately wire money before they have an opportunity to fully review the email’s content and question its legitimacy. In most cases, these scams are relatively simple for the criminals to conduct, but the consequences can be devastating. The NJCCIC recommends homebuyers and real estate entities educate themselves and others on these malicious tactics and remain vigilant during and immediately after the closing process. We highly recommend real estate businesses, including real estate attorneys and title agencies, implement new policies aimed at preventing fraudulent wire transfers and other scams. For example, including disclaimers in email signatures warning the recipient of these scams, and forbidding the sharing of wire transfer account information via email and instead utilize video chat applications, phone calls from trusted numbers, or in-person meetings. Additionally, homebuyers should never trust email as the sole source of instruction for wiring money related to these transactions and instead receive confirmation of these details in person or over the phone. Effective immediately, school board candidates are permitted to have slogans appear with their name on the November General Election ballot. Much like independent candidates that participate in the General Election, school board candidate slogans are limited to three words and cannot contain the name of any party participating in New Jersey’s primary elections. The same law also permits school board candidates to file joint petitions and share the same slogan. For more information about the new law, please call the Clerk’s Office at 973-579-0900, ext. 1501. Registered voters who will not be able to get to the polls for the June 5 Primary Election may vote early in-person at the Sussex County Clerk’s Office in Newton. Because the deadline to receive a mailed ballot has passed, voters now must apply for an absentee ballot in person. Early voting is being conducted at the Clerk’s Office during regular hours from 8 a.m. to 4 p.m., with extended hours offered Saturday, June 2nd from 9 a.m. to noon. Voters also may vote early in person up until 3 p.m. Monday, June 4th. The County Clerk’s Office is located on the main floor of 83 Spring Street in Newton, Suite 304, accessible from either Spring Street (front entrance) or Trinity Street (rear entrance). More information about voting can be obtained by calling 973-579-0900 or by visiting the Clerk’s Website at www.sussexcountyclerk.org.